Private estate "Smereka" is located in Lazeshchina. 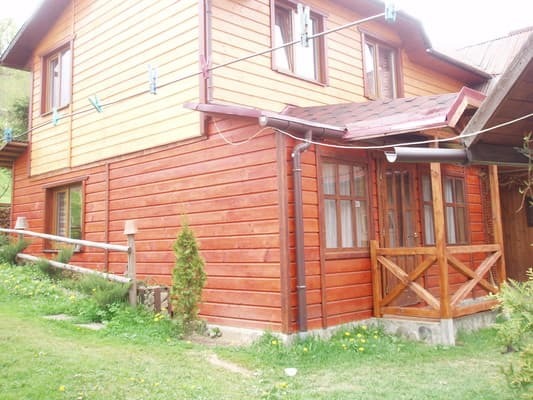 Guests are offered accommodation in a two-story cottage with windows overlooking the tops of Hoverla and Petros. On the first floor there is a double room, a veranda, a corridor, a bathroom with a washing machine and a kitchen. The kitchen is equipped with a combination plate, a refrigerator, a coffee maker, a kettle and a set of necessary utensils. The second floor includes two double rooms that are equipped with a bed and a wardrobe. 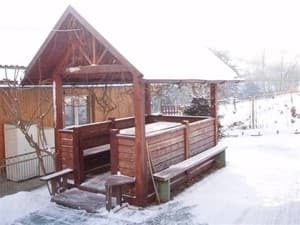 On the territory of a private estate there is a gazebo, a brazier and free parking for cars. For an additional fee for residents can arrange tours, hiking in the mountains, in the summer - picking mushrooms and berries. 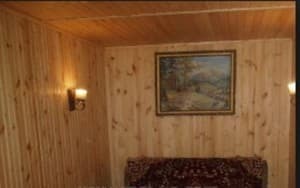 The distance to the nearest store is 500 m, to the sauna - 300 m, to the vat - 2 km, to the kolyba - 2 km. The rental of skis is located at a distance of 800 m. Distance from the private estate "Smereka" to the ski resort Bukovel - 12 km, to the resort Dragobrat - 10 km. Not far away is the highest point of the Ukrainian Carpathians - Mount Goverla (about 12 km from the manor). Within a radius of 10-20 km there are: the Huk waterfall, mineral springs in the village. Kvass and the Trufanets waterfall, popular peaks of the Khomyak, Petros, Kukul and Verkho-Dybri mountains. The distance to Yaremche and to Rakhiv is 40 km. Description of the room: Cozy double room. 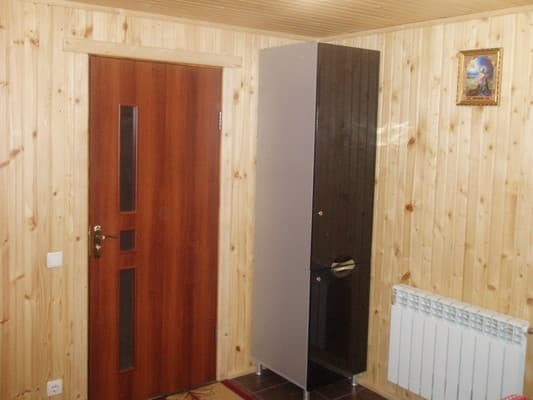 The room is decorated in wood and equipped with a double bed. Description of the room: The cottage has 2 bedrooms with double beds and a living room with a sofa bed. Мы искали домашнего уюта, не пропитанного натянутыми улыбками и холодным сервисом. И именно это мы и нашли у хозяина усадьбы. Уютный домик, с двумя комнатами на втором этаже, кухней, гостиной и удобствами на первом, оставили незабываемые впечатления от отдыха. Хозяйка показала, что такое настоящая традиционная "Гуцульська Кухня". 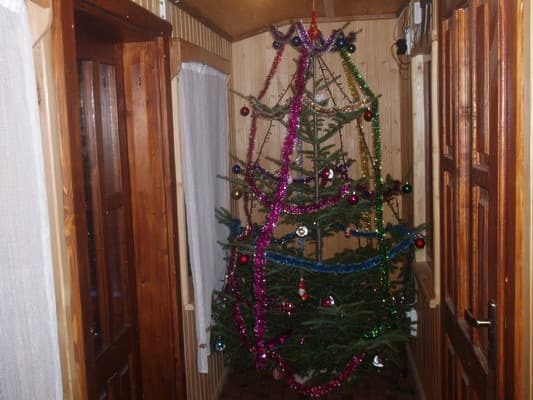 Ни в одном ресторане этого не найдешь. Отдельное спасибо за знакомство с удивительным миром горных растений. Спасибо хозяевам за отличные выходные! Погода была переменчива и капризна, но правильно выбранное место проживания компенсировало эти неудобства. Children under 5 years without extra bed stay free. By agreement of the surcharge. 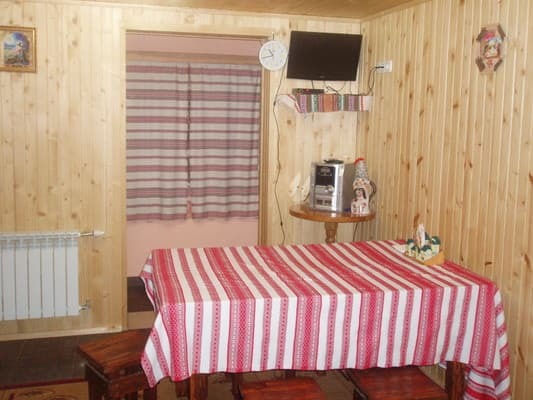 There is a possibility to prepare their own meals in the fully equipped kitchen. Private estate "Smereka" is located in Lazeshchina. 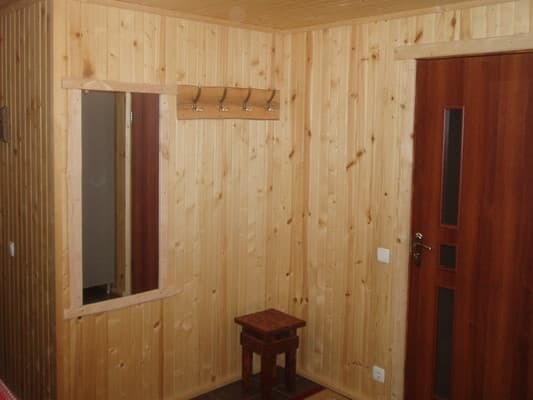 The distance to the nearest store is 500 m, to the sauna - 300 m, to the vat - 2 km, to the kolyba - 2 km. The rental of skis is located at a distance of 800 m. Distance from the private estate "Smereka" to the ski resort Bukovel - 12 km, to the resort Dragobrat - 10 km. Not far away is the highest point of the Ukrainian Carpathians - Mount Goverla (about 12 km from the manor). Within a radius of 10-20 km there are: the Huk waterfall, mineral springs in the village. Kvass and the Trufanets waterfall, popular peaks of the Khomyak, Petros, Kukul and Verkho-Dybri mountains. The distance to Yaremche and to Rakhiv is 40 km.